NEWS FLASH 22 August 2016 - Mount Kembla koala rediscovered !!!!!!! During August 1803 the first live specimens of the koala were scientifically examined in Sydney and the discovery of a new Australian mammal was announced to the public. The koalas initially came from the Mount Kembla region of New South Wales, located on the coast approximately 50 miles (80 kilometres) south of Sydney. A number of live and dead specimens were initially studied by the renowned visiting English botanist Robert Brown and his Austrian artist colleague Ferdinand Bauer. The type description of the koala was made by Brown at the time of this inspection, though it was never published. The earliest known drawing of the animal was also taken around the same time by Bauer,on 15 August 1803. 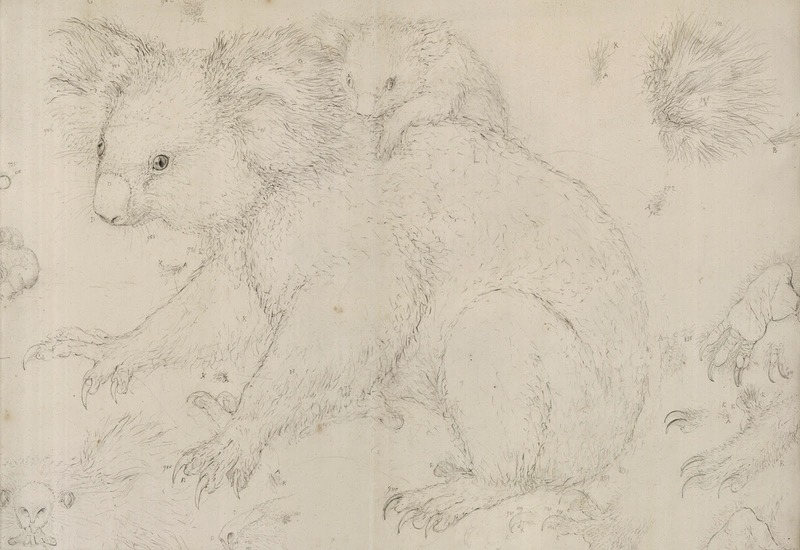 Ferdinand Bauer, Koala from Mount Kembla, pencil sketch, 15 August 1803. Natural History Museum, Vienna. At present there is no definitive scientific record of the type specimen of the koala in the published literature. This is unusual, especially in light of the work of both Brown and Bauer. The earliest published scientific description of the koala instead comes from the initial application of a scientific name by the French during 1816, some 13 years after the Mount Kembla discoveries. The history of the koala's rather convoluted scientific discovery and description is outlined in detail within the author's article The Scientific Discovery of the Koala 1803. Brown's Didelpis coola of 1803 was to eventually become Phascolarctos cinerus in 1821. Just as the scientific description of the koala is somewhat lost and confused in the mists of time, so also there had been, as of July 2016, no official recognition of the koala's existence - historic or contemporary - in the Illawarra, by local, state or federal authorities such as Wollongong City Council or the National Parks and Wildlife Service. Yet it seemed obvious that the animal survived, as the Illawarra region is bordered by coastline on the east and to the west by a steep, forested escarpment, at the back of which is a largely uninhabited water catchment area, which in many instances is prime koala habitat. It was always likely that koalas continued to breed within this catchment area, despite its being decimated over time as a result of shooting, bushfires, introduced feral animals such as dogs, cats and foxes, and the impact of humans such as road kill. Unfortunately no surveys were carried out to confirm or deny this. Monitoring of the well-known Appin - Campbeltown koala populations on the north and north-west border of the catchment, along with those in state forest areas to the far south and south west of the Illawarra continued to take place. It was therefore something of a mystery as to why the central Illawarra catchment area was not identified as a koala habitat, and why comprehensive surveys never occurred. Those studies and discoveries in the state forests were usually generated as sections of habitat were cut down, whilst the Appin - Campbelltown studies were generally related to residential development applications and further incursions on habitat. By July of 2016 there were regular stories in national newspapers expressing concern over the possible extinction of this iconic Australian animal. It was therefore the hope of many in the Illawarra community that the koala would one day "return" to the Illawarra - be rediscoved there - and that the catchment area would then be promoted as a viable, sustainable, koala habitat and reserve. Some of this history and discussion regarding rediscovery and its implications are highlighted in the short film In Search of the Illawarra Koala (2013). Jodie McGill and Georgina Element, In Search of the Illawarra Koala, video, Briar Productions, 2 September 2013. Duration: 7m 32s. This image was made public on Facebook by the Search for the Illawarra Koala group on 6 September. 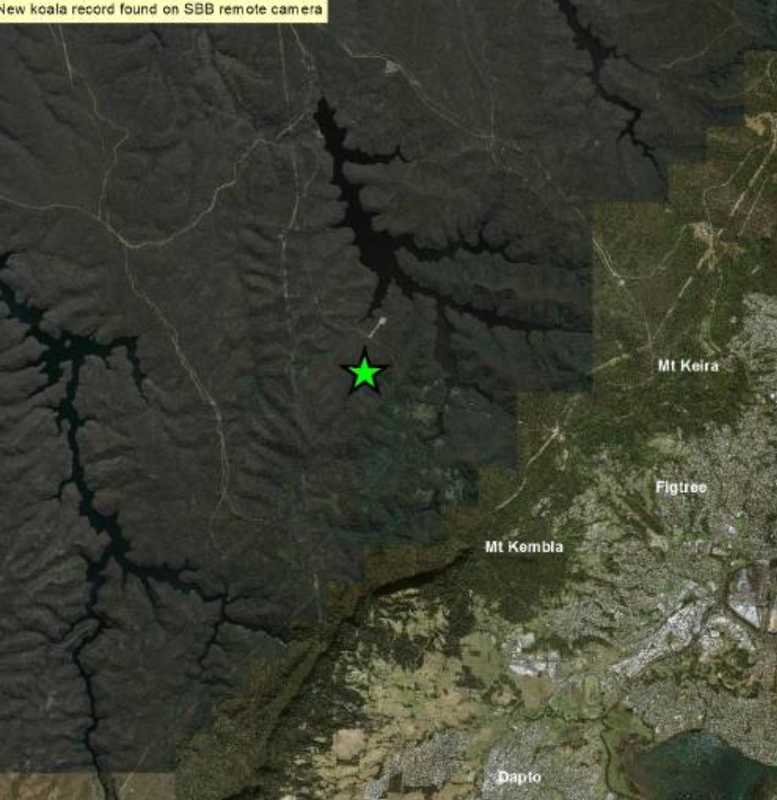 The animal was records approximately 5.5 kms north west of Mount Kembla, early in the morning. Location of koala sighting, 22 August 2016. It has been suggested that it came from the Campbelltown-Appin colony to the north. However, as no previous surveys had been carried out within the catchment area, it is also possible that the animal and its associates had been present in the area for an extended period. Koalas appear to have returned to a coastal strip near Wollongong in the Illawarra, in a rare reversal of the usual trend towards extinction. An infrared camera placed about 5 kilometres from Mt Kembla, west of Wollongong, caught footage of the marsupial in late August. Koalas are thought to have become extinct to the area in the 1930s when land was cleared for agricultural purposes. James Dawson, from the Office of Environment and Heritage, said the habitat had now grown back and it appeared koalas were finding it again. "It's the first image we have got of a koala in the eastern edge of the catchment in the vicinity of the Illawarra escarpment for many, many decades," he said. "To see a koala and those bright, shining eyes is a fantastic sight to see." The koala sighting marks a complete circle for the region, because the first whole specimen of a koala to be collected in Australia came from the same area on Mt Kembla in the early 1800s. However, closer to the ocean, the habitat has become unsuitable for koalas, meaning they are unlikely to spread further east. "Below the escarpment on the coastal plane was also very good habitat once upon a time," Mr Dawson said. "Almost all of the habitat is now gone, so I don't think we expect to see populations of koalas in these areas on the coastal plane. "But in these areas above the escarpment, it does appear koalas are making their way back into this area." The surprising discovery was first made public via a post on a local documentary filmmaker's Facebook page. The In Search of the Illawarra Koala group wrote:"It is with absolute excitement and joyous tears that we have the honour of announcing that only a few weeks ago, a Kembla koala was sighted alive and well on a camera trap survey. Thank you to NSW Office of Environment and Heritage for sharing your photo with us, so we can share it with the world." A wide range of comments expressed disbelief and joy at the finding, tempered with concerns for the animal's safety. They are now rarely seen in the south-east corner of New South Wales. There have also been reports of a catastrophic population crash in koala numbers in south-east Queensland earlier this year. According to Michael Organ, the European and scientific discovery of the koala took place between June and September, 1803. The first animals were brought to Sydney during August, 1803 and were immediately documented for scientific purposes. The drawings, descriptions and portions of the deceased animals were then despatched to England. Koalas remain in small groups west of the Illawarra escarpment, where the New South Wales Government has funded the Southern Highlands Koala Conservation Project in response to dwindling numbers. And on the state's far south coast, conservationists celebrated in August this year when a healthy adult koala was located and photographed by a wildlife contractor at Mumbulla Mountain north of Bega. The area was previously used for logging, but earlier this year became incorporated into a new flora reserve. It was also a rare sighting in a location where many thought koalas had gone forever. A koala caught on film north-west of Mt Kembla has given hope the native marsupial is moving back towards the Illawarra escarpment after an 80 year absence. 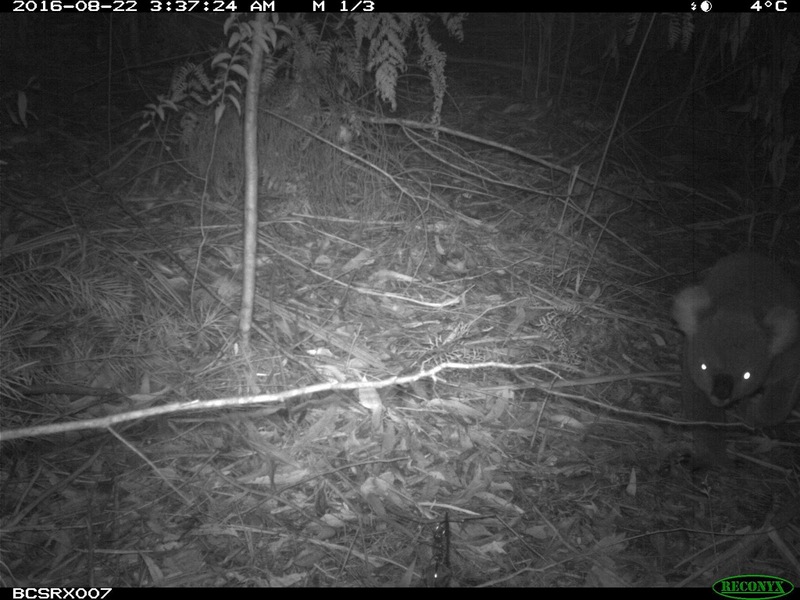 It is the first time in decades a koala has been spotted in bushland close to the Illawarra escarpment and was only captured by accident when an infrared camera placed 5.5 kms north-west of Mt Kembla in the hope of spotting the endangered Southern Brown Bandicoot, instead captured footage of the koala at 3.37am on August 22. A NSW Office of Environment and Heritage (OEH) spokesperson said koalas were thought to have become extinct to the area in the 1930s when land was cleared for agriculture. OEH has previously identified the area above the escarpment in the Metropolitan Special Area drinking water catchment, as potential habitat for koalas in a habitat modelling study from 2007, as the trees and soils are highly suitable for the animals. The spokesperson said the habitat had now grown back and it appeared koalas were finding it again. 1803 - April - koala specimens obtained from the Mount Kembla area and brought in live and dead to Sydney for study. Dissected and described by scientist Robert Brown and drawn by artist Ferdinand Bauer. Ferdinand Bauer, Koala, watercolour , British Library. Based on the original pencil sketch of April 1803. 1920s - koalas in the National Park, north of the Illawarra, decimated by bush fires, feral animal attack and shooting for pelts. 1933 - koala reported at Robertson. 1939 - talk at the Thirroul Railway Institute on "The Vanishing Koala." c.1948 - koala reported at the bottom of Bulli Pass. Possibly escaped from a household where it was kept as a pet. c.2000 - koala reported near Macquarie Pass, Robertson. 2015 - koalas known to be present in the Appin area, adjacent to the catchment area. 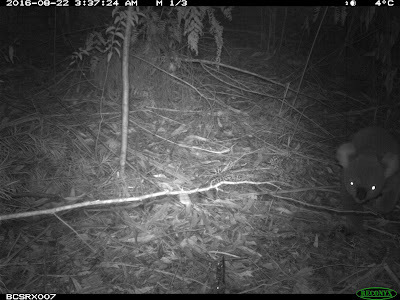 2016 - 22 August - a koala is caught foraging on the ground at Mount Kembla on a Department of Environment and Heritage camera. Element, Georgina and McGill, Jodie, In search of the Illawarra Koala (video), Briar Productions, 2013. Duration: 7 mins 22 secs. YouTube - available URL: http://youtu.be/6Frehh4_7_g. -----, In Search of the Illawarra Koala, Facebook, 2014. Available URL: https://www.facebook.com/BriarProductions/. Field, Anthony, Film reveals koala first found in the Illawarra, Wollongong Advertiser, 7 August 2013. Available URL: http://www.illawarramercury.com.au/story/1689389/film-reveals-koala-first-found-in-illawarra/. -------, Keep watch for koalas - Illawarra residents urged to join Koala count, Wollongong Advertiser, 10 November 2014. Available URL: http://www.illawarramercury.com.au/story/2686192/keep-watch-for-koalas/. Johnson, Lisa, Koala captured on film near Mount Kembla, Illawarra Mercury, 8 September 2016. Koala captured near Mt Kembla, 96.5 Wave FM (radio), 8 September 2016. McLaren, Nick and Huntsdale, Justin, Koala spotted in Illawarra coast for the first time in decades reverses trend towards extinction, ABC Illawarra (radio), 8 September 2016. Organ, Michael, The Discovery of the Koala: Hat Hill (Mount Kembla), New South Wales 1803 [webpage], 9 March 2006, available URL: http://www.uow.edu.au/~morgan/koala.htm.